— Have you or someone you love been personally impacted by breast cancer? — Do you an active social network presence that could be mobilized for GOOD? — Are you willing to either PARTICIPATE in or START a Virtual Blood Drive campaign that makes it easier and faster to DONATE BLOOD to get life-saving blood platelets to those fighting breast cancer? IF SO JOIN US through #SleevesUpForBreastCancer. 1. Be a PARTICIPANT in our Popular Genius #SleevesUpForBreastCancer virtual blood drive campaign by following links below to book a blood donation appointment at a Red Cross location near you! 2. Be a CAMPAIGN STARTER by visiting https://sleevesup.redcrossblood.org to begin your own #SleevesUpForBreastCancer virtual blood drive campaign — and ask your networks to participate! Together we can make a difference by rolling our #SleevesUpForBreastCancer!!!!! Blood platelet donations are lifesaving for breast cancer patients. Platelets are tiny but important cells in your blood that help your body control bleeding. While breast cancer patients undergo treatment, a major side effect is low platelet count (thrombocytopenia). A transfusion of platelets not only helps cancer patients with clotting, but it also provides the energy and strength to keep fighting. Low platelet count is a common side effect of chemotherapy. Patients may have to wait until platelet levels go up in order to continue with chemotherapy or to have surgery. More than 70% of platelets are used in cancer treatments. Platelets can be safely donated every seven days, up to 24 times a year. Every 30 seconds someone in the U.S. needs platelets. Platelets must be transfused within five days of donation. Platelets cannot be manufactured – they can only come from volunteer donors. An estimated 38% of the U.S. population is eligible to donate blood at any given time. Of that eligible population, less than 10% actually donate each year. To mobilize more people to donate more often, Red Cross created SleevesUp. SleevesUp is a virtual blood drive campaign that can be created online at https://sleevesup.redcrossblood.org in just a few minutes. 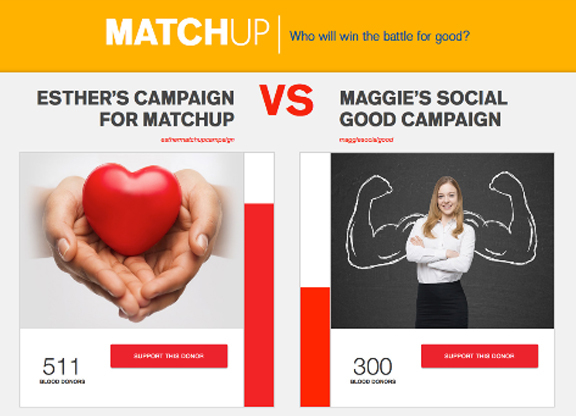 The campaign creator follows three steps to personalize their SleevesUp challenge and share it with their networks using a custom campaign URL, Facebook, Twitter or e-mail. Your networks can pledge their support immediately by making an appointment to donate blood or platelets at a donation center convenient for them. Goals for participation in a campaign are set, tracked and promoted by the campaign starter. The Red Cross SleevesUp team provides content support to encourage others to start campaigns of their own.